Firstly, I cleaned my hands and cleansed and toned my face and let this touch dry to make sure no unnecessary gunk effected this review! Then, I put a very small blob of Ivory 100 on the back of my hand - I, firstly, noticed how light and airy the foundation is and it really is 'mousse'-like. I was never a fan of Maybelline Dream Matte Mousse so I was a little worried this would be similar. The foundation was easy to swipe onto my foundation brush and away I went, blending in the foundation into my cheek and chin (just testing a small section of my face where my eczema is worst). 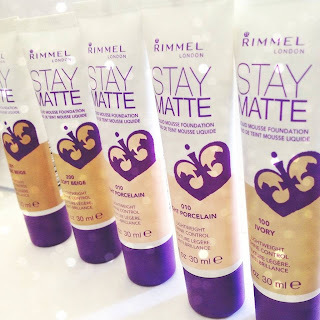 I was honestly really happy with how only one small layer of the Stay Matte made my skin so soft and really well covered! You can hardly see my eczema red patch on my chin with just one small application. Another thing that really impressed me was the Matte texture and look of my skin after the application! I ALWAYS have to put powder on as well as liquid foundation but with this it would be silly to! The shade Ivory 100 also suits my skin perfectly and tide lines or streaks were non-existent! First impression = a great one! 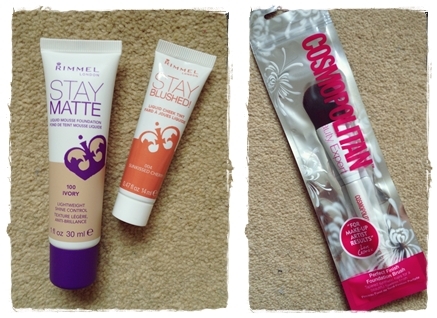 To add to this, I then tested out Rimmel's Stay Blushed! I chose to try out the 004 Sunkissed Cherry shade as I felt it was more natural that 001 Pop of Pink but this shade would be perfect for a night out, I reckon. This is also really 'mousse' based - as you can see in the image above! You literally need a TINY bit of this blush mousse to create a lovely, even tint on your cheek. I also used my foundation brush to apply this as you definitely want an even coverage as the blush mousse really does apply instantly and blends in really easily! For £4.49 I am honestly so shocked at how good this product is! 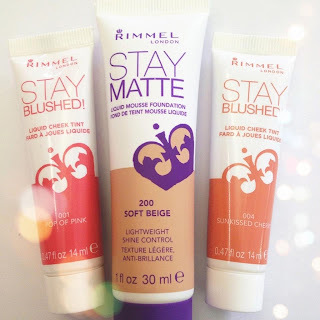 Not only does both the foundation & the blush leave a weightless, baby smooth finish, it also helps the appearance of my dark circles under my eyes as it reflect the light! I am one very happy blogger right now! There you have it foundation & blusher loversssss... My review & I hope this helps out anyone who has seen these products and wondered how good they truly are! How does it compare in shade to NC15? Is it darker?